Broyhill furniture has been around since the late 1930’s and have maintained a keen eye for high quality craftsmanship and design style. Broyhill Furniture has a style that is characterized largely by influences of traditional American furniture techniques and solid wood designs. Broyhill keeps a keen eye on current design trends and uses their learned awareness of evolving trends to keep producing relevant and modernized furniture. At one time, Broyhill was the largest privately-owned furniture company in the world and had been run by descendants of the Broyhill family since it’s conception. Today, Broyhill is an international furniture brand that offers tremendous products and can be bought online easily and affordably through retailers such as Wayfair or Amazon. Broyhill furniture comes from a long history of designing American traditional styles featuring elegant solid woods. This isn’t a hot-style in modern markets, but Broyhill’s intimate knowledge of quality craftsmanship will never be out of style. Such collections as the Bethany Collection by Broyhill demonstrate their ability to utilize their strong knowledge of more traditional design approaches while still producing relevant and contemporary furniture. Many manufacturers attempt this type of fusion of styles and many get it really wrong. Traditional furniture in America isn’t just about ornate carvings and chestnut, it’s about pride in the underlying craftsmanship. There’s an old saying in the furniture world about quality—that it can be told by checking to see if the bottom of the drawers have been sanded. Obviously, there is no practical need for sanding the bottom of a drawer as no one will ever see it, but should you flip over a drawer chest to discover there are indeed smooth surfaces, you’d likely find an astute level of attention to other details as well. The best furniture brands in on the market today are often overlooked for their lack of flashy materials, or their sacrifice of quality for larger production capabilities. Broyhill Furniture is one of those brands that often get less attention than they deserve, and the quality of their products are often overlooked. Another great example of quality and style is the East Lake Collection by Broyhill Furniture. This contemporary collection does well to illustrate Broyhill’s versatility of style, and while this collection might appear to be plain and similar to other such designs—the quality of craftsmanship makes all the difference. It’s curved unique drawer pulls and metal-capped feet add a sharp look, but it’s solid jointery and quality components make it leagues beyond similar designs from other brands. As with many of their collections, Broyhill offers a full line of pieces beyond what you might consider standard—to help meet the needs of any space and function. For example, within the East Lake collection, there is an optional 3 Drawer Media Chest which can be used as a supplement or replacement for a dresser and mirror combination. Media chests are great for those with televisions in their bedrooms, but often undesired by those without. By offering a full line of products, Broyhill is able to offer the best solution for any buyer. Broyhill furniture is now part of the Heritage Home Group which is a large furniture holding company which has a tremendous portfolio of other furniture brands as well—including Thomasville, Lane, Henredon, Drexel Heriage, and Pearson Furniture. These are all tremendous brands of furniture, and unlike many other large Home Brands collectives—the Heritage Home Group clearly has an eye for leaders within the industry. Broyhill marks one of the most historically notable brands in this collection, and has shown an immense craft throughout the last 90 years of innovative manufacturing. Many of Broyhill’s designs feature hard woods synonymous with traditional designs, though re-imagined with more contemporary finishes. 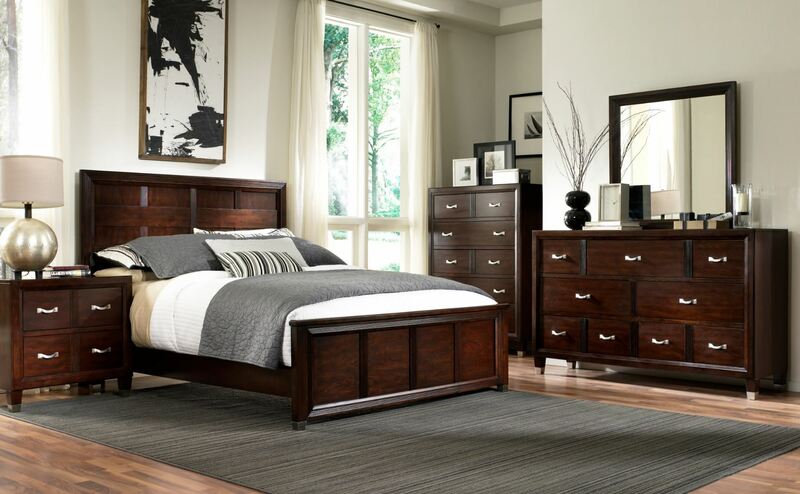 Take the Cascade Collection by Broyhill for example; with turned-post feet, reeded drawer fronts, and elegantly-curve undermolding—this collection hints strongly towards a traditional feel. Broyhill’s choice selection of a light natural Acacia finish pulls the overall feel of each piece in the Cascade collection more towards a contemporary look. When shopping for furniture, there are a lot of careful considerations to be made such as budgetary goals, room styles, and longevity. Something that many people often overlook is the consideration for collection depth—meaning if you buy a bedroom set, is there also a dining set available? This isn’t important to everyone, but if you hold strong favor towards having a unified presentation of furniture in your home buying from brands such as Broyhill can make a huge difference. Imagine you buy a bedroom set with a King Size bed, a Night Stand, Dresser, and a Mirror; you’ll have a distinct impression of that room every time you enter it. If you want to spread that same design feel to another room, you’ll often be left to fend for yourself in trying to match finishes from other brands. Quality furniture brands like Broyhill offer extensive collections of furniture, and if you fall in love with a bedroom you buy from them, you’ll likely be able to get a matching kitchen table with chairs. This type of flexibility also offers ease in expanding you current rooms design, such as adding a 6-drawer chest to compliment your dresser and mirror. To get a better idea of this, check out the Jessa Collection by Broyhill to explore all the various pieces they offer that all match in style. Broyhill is among the top furniture brands on the market today, and are available at any number of local furniture stores nearby. To find a local dealer near you, visit the Broyhill store locator page. Local furniture stores are pretty notorious for adding a large markup to their prices, and if you already have a good idea of the brands and styles of furniture you want—you’ll likely be able to save up to 40% if you are willing to buy furniture online. While making such large purchases online used to be a gambling act, the modernization of eCommerce has given rise to very well-trusted furniture retailers such as Wayfair to buy from. Broyhill furniture available for purchase through Wayfair, and is eligible for free-shipping in nearly all cases. By shopping around online, you can find the best price for the furniture that best suits your needs. By knowing which furniture brands, such as Broyhill, are the most-trusted and highest-quality on the market—you can then spend your time focusing on look and price. Broyhill is one of the oldest names in furniture and have evolved over many shifting trends in the design market. They offer tremendously well-crafted furniture that reflect the latest looks in home designs, and their deep collection offerings allow a truly harmonious design to emerge.